What a wonderful summer! August was a month of bubbling activity on our block and among the churches of the Salem Creek RCC! We started the month with our group of churches holding a joint Vacation Bible School, which was hosted by Trinity and Home Churches. Volunteers from Home, Messiah, St Philips, and Trinity helped make activities for all ages come to life as we studied the Bible as a library of books — and we were proud to have the Trinity youth volunteer to sing the 66 books without missing one! The strangest feature of the VBS was a mysterious “Bible Clown” who showed up briefly at the start of each program. Little Ann Workman found him quite terrifying. 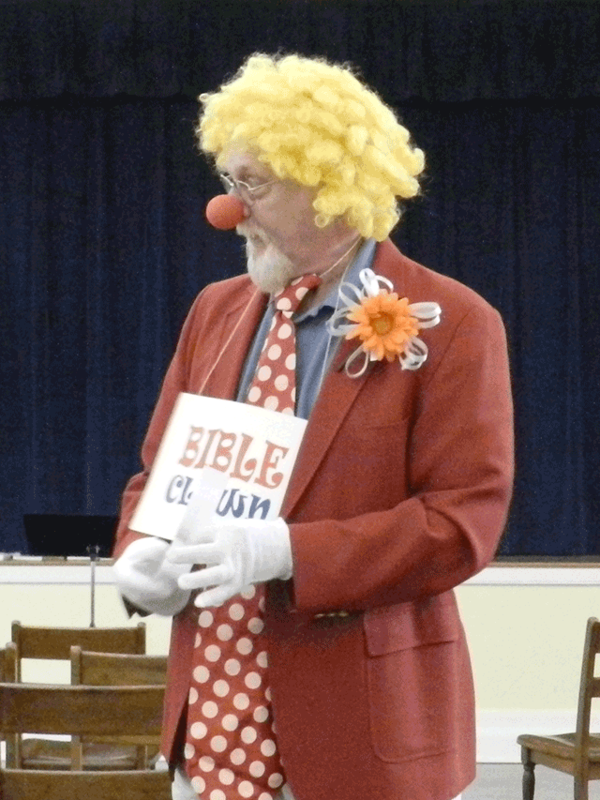 Several children noticed that they never saw Bible Clown and Pastor John in the same room at the same time – hmmmm! Many of our members contributed school supplies to assemble the backpacks that were given away at the Anthony’s Plot block party, which had the theme “All Things Good in Our Neighborhood!” That block party was a smashing success, with almost 450 attending. Many Trinity members were present as volunteers, making the day happen smoothly. On August 18, the wonderful Trinity Zimmer-Lewtak pipe organ was featured in the “Sounds of Summer” organ series. We had over 160 people attend on a rainy Monday night to hear the concert — a great turnout! 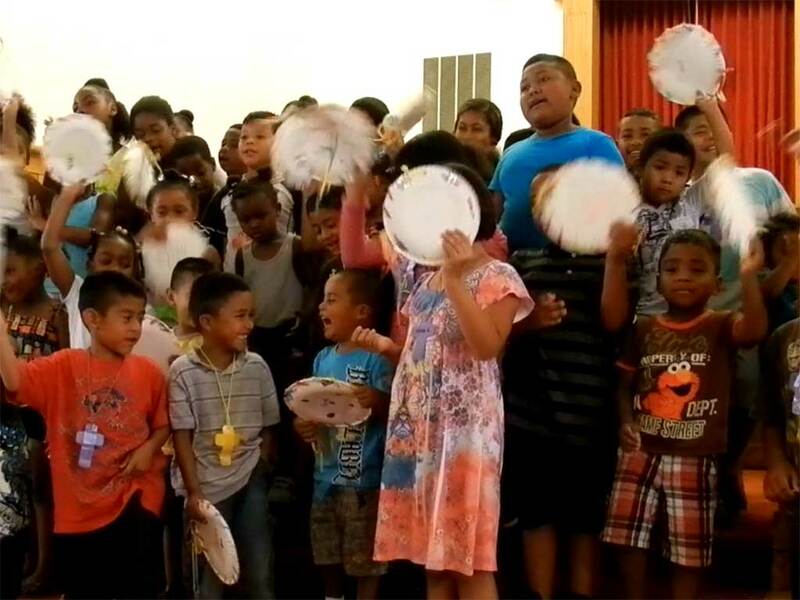 The month closed with a special Vacation Bible School at St. Philips Church, specially designed to coincide with the week that the school lunch program is on hiatus. Volunteers from of group of churches came together to have a wonderful program for school-age children in the Bon Air and surrounding neighborhoods. Many folks contributed food, and in addition to joyous activities, the children had a hot lunch every day – which many of them would not have had without our work! My heartfelt thanks to all the people who put in many hours of volunteer work to make these events happen! You’ve touched many heart with grace, children with fun and Bible stories, and fed some very hungry tummies! This was the busiest August I remember for many years, and it was fantastic! This entry was posted by PastorJohn on September 11, 2014 at 1:57 am, and is filed under Children, Christian Life, Church Year, Family, Grace, Gratitude, Racial Reconciliation, Regional Conference of Churches, Uncategorized. Follow any responses to this post through RSS 2.0. Both comments and pings are currently closed.